How far will we go if our love is not returned? 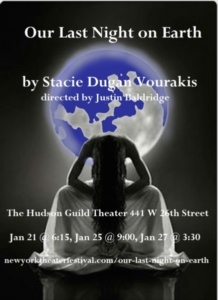 In Stacie Dugan Vourakis play Our Last Night On Earth, the rollercoaster of twists and turns will have you guessing until the last minute. This morbid and dark look at unfaithfulness in the South, asks a lot of questions and makes you really think about the right of killing another human being, despite their crimes. We first meet Tia (Silvia Dionicio), Delphi (Roberta Pikser) and Mia (Alyssa Simon) who are taking care of Katherine (Lydia Kalmen) a comatose woman who was the victim of a killing. As they watch her, they knit a long scarf. When Hemma (Katie Calogero) and her overbearing mother Lila (Nora Hummel) enter to see Katherine the door is open and the workers are gone. Katherine’s husband Taylor (Christopher Michael Ward) enters who’s a gynecologist. Hemma isn’t exactly the doctors biggest fan, nor does she want her sister to stay with him. She is furious that her mother has dragged her to what turns out to be the execution day for two boys who put Katherine in this state. To Hemma nobody should be executed for any crime they have committed. Alicia (Kiara Wade) enters and immediately conflicts with Lila whose husband was brutally killed in this robbery gone. It turns her husband was a boy that Lila had taken in and raised until he was 6. Both Hemma and Katherine were raised with him. After her husband’s death Lila sent him to his aunts because he was black and did not see how raising him would help. Hemma and Katherine were not happy with those turn of events. All Alicia wants is a confession but be careful what you wish for. Who did what to who, who brought on this crime of passion, love not being returned and loyalty, all come into play as this drama reminds you of the film “The Thin Blue Line”. The actors all helped bring this piece to life. Director Justin Baldridge helps keep this piece at its paces, but I would suggest not having the lines overlap in the beginning, as you could not understand what was happening. Ms. Vourakis play will keep you on your toes. Her dialogue is snappy and you never know where she is going until she gets there. Expect a macabre look at life with Our Last Night On Earth, but even the killer gets his comeuppance in the end. Our Last Night On Earth, NY Winterfest closed.